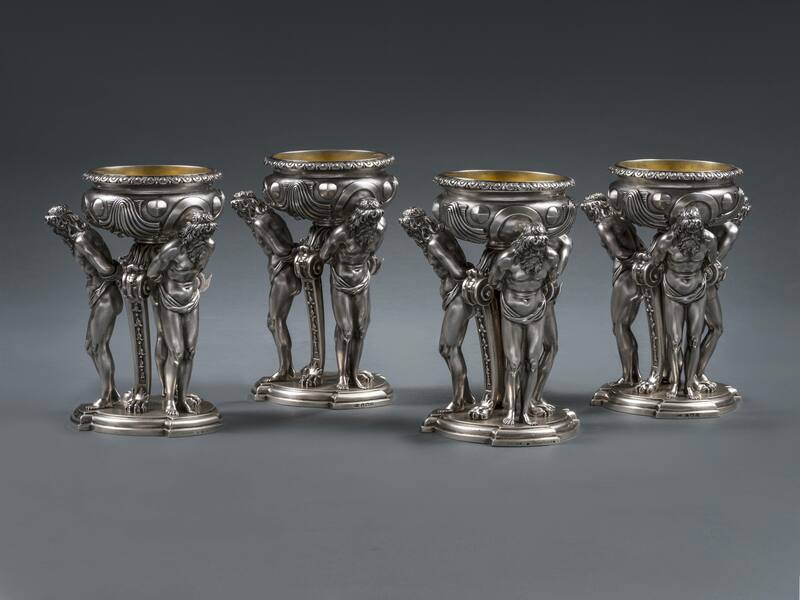 The name of Paul Storr will be familiar to many of you who are interested in antique silver and this spectacular exhibition features over two hundred pieces and in fact traces his entire career from an early set of George III salts (1791/92) to Victorian pieces inspired by his designs after he had retired in 1838. Provenance: Presented to Sir John Gladstone (1764-1851) on Monday, 18 October 1824, following a public subscription raised by the people of Liverpool, thence by descent. 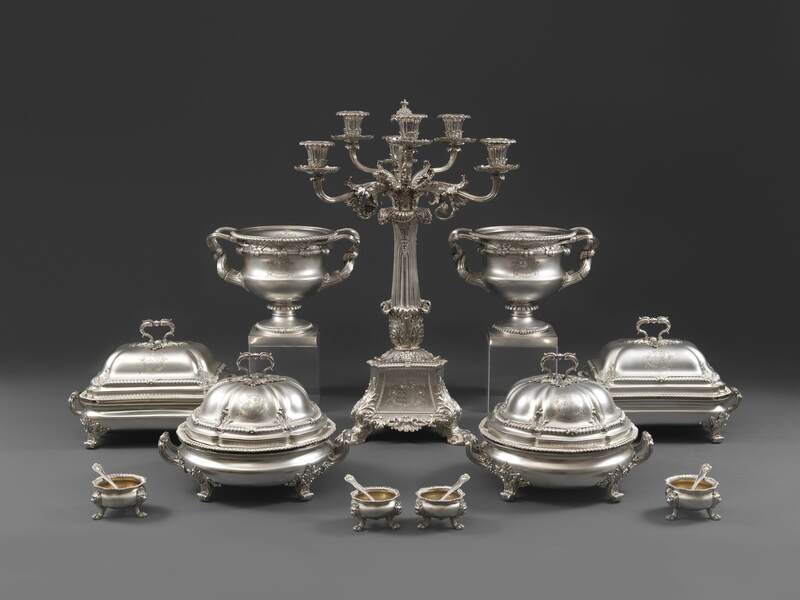 This magnificent silver dinner service, commissioned by the people of Liverpool from Paul Storr, was presented to Sir John Gladstone (1764-1851) on Monday 18 October 1824, by the townspeople of Liverpool, to celebrate his role in the promotion of the trade and commerce of the city. Photograph shows part of the dinner service. The wonderful thing about this silver is its patina which results from it being used, often on a daily basis. Storr made silver for the great and good of his era whether royal, noble, a military hero or just plain wealthy. 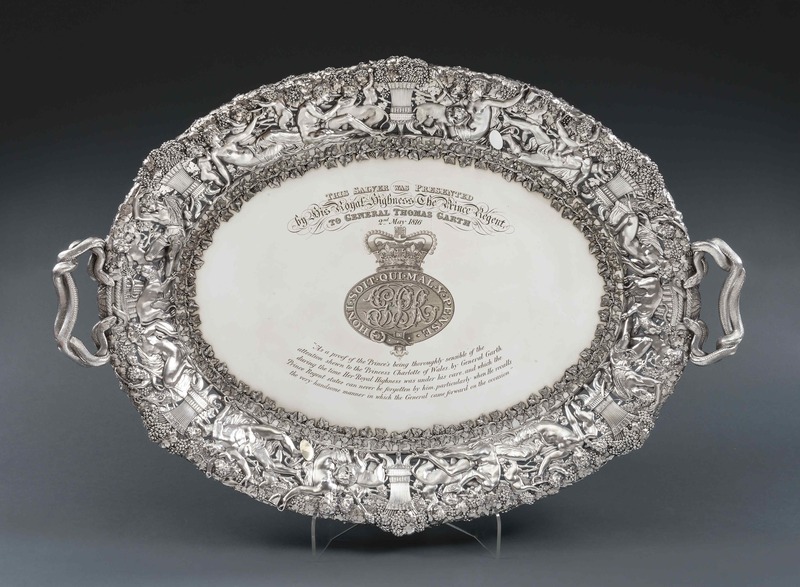 Royal George III presentation tray, London, 1815. The silver scholar Christopher Hartop, author of a new book on Storr, says: “Storr’s amazing achievement was the sheer scale of his activity, and the ingenious way he merged creative talent and cutting-edge technology. He was a gifted entrepreneur with a flair for spotting the best artists, including celebrated painters and sculptors as well as designers, draughtsmen and modellers. Fine art and the ‘plastic arts’ were united as never before. In addition Storr’s use of innovative technology is breath-taking; it was the Microsoft of its day and meant that silver was available to a much wider client base”. These are of the highest quality in every aspect, as one would certainly expect from the best pieces made by Paul Storr during this period. Height 6 1/4in (15.75cm); diameter :4 1/2in (11.5cm). This entry was posted in Decorative Arts, Silver, Visual Arts, Works of Art and tagged Decorative Arts, Koopman Rare Art, Liverpool, London Silver Vaults, Paul Storr, silver, Visual Arts.